The railroad world is constantly changing, and even though the change is often slow we are sometimes surprised to wake up one day and find something that has always been there to suddenly be gone. 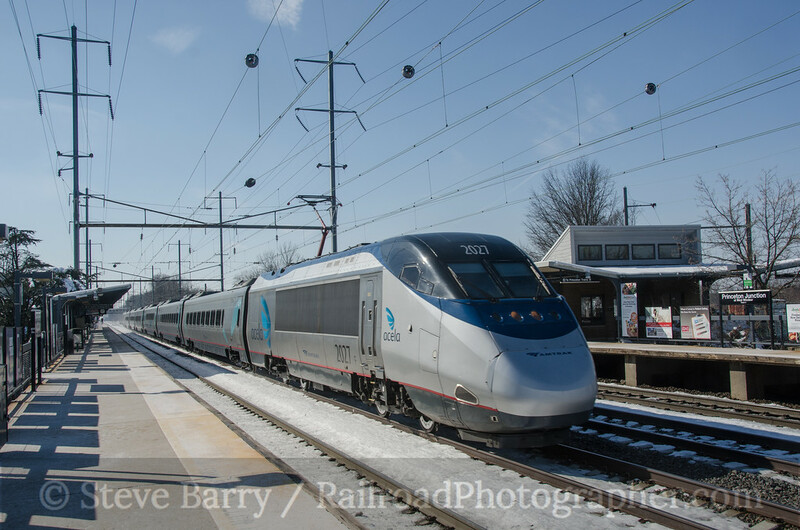 On February 7, 2014, the first tiny step in what will ultimately change the entire Northeast Corridor on Amtrak occurred, as a new locomotive made its first revenue run. First, let's step back one evolutionary step. 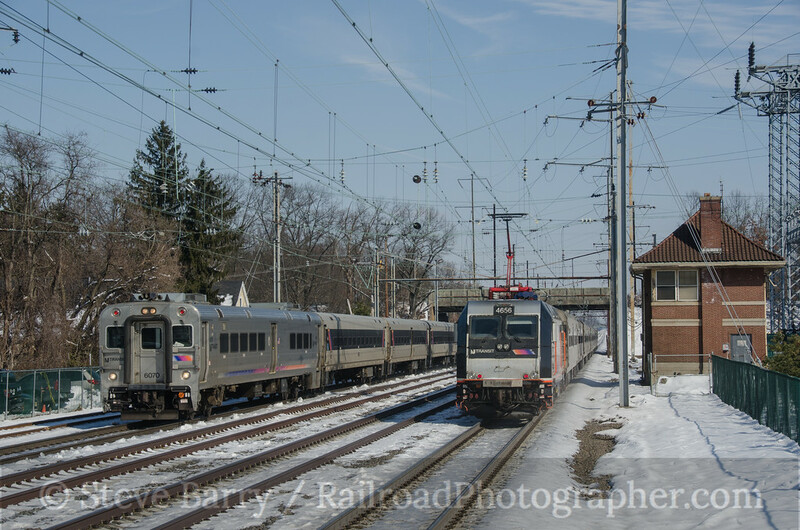 The Northeast Corridor that we know today was built by the Pennsylvania Railroad in the 1930s as a massive upgrading of the main line between New York and Washington. By the 1940s the primary locomotive on the Corridor (it was not known by that name at the time) was the classic GG1 electric locomotive, designed by Raymond Loewy. The first run by a GG1 occurred on January 28, 1935. In 1967 the Pennsylvania Railroad became part of Penn Central, and in 1976 the bankrupt PC was folded in Conrail. On the passenger train side, Penn Central was able to rid itself of intercity trains with the formation of Amtrak in 1971. 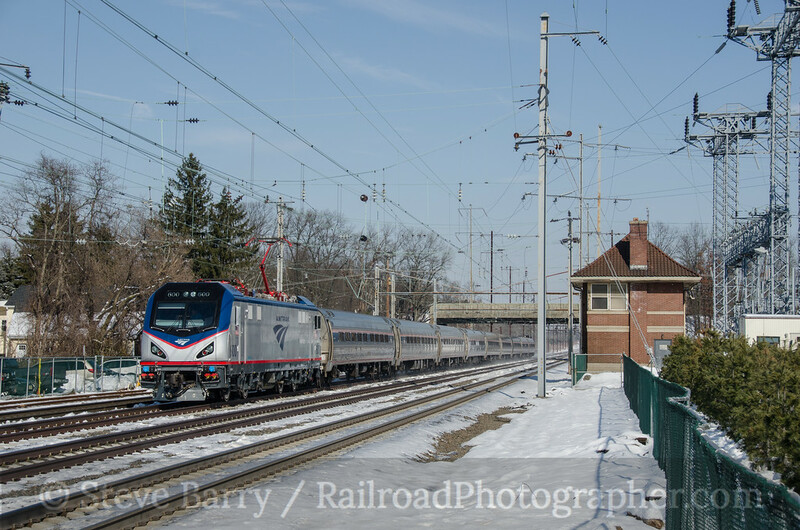 Amtrak took over operations on the corridor and had to replace the four-decades-old GG1 fleet. General Electric E60's were purchased to supplement the GG1s, but Amtrak ultimately settled on the Swedish-designed AEM7 locomotive. The first AEM7 entered service in 1979, and by 1982 the GG1 had been vanquished (save for some holdouts on New Jersey Transit, which were gone in late 1983). So that brings us to today. The AEM7s are now over 30 years old (65 were produced, but time has thinned the fleet somewhat) and in need of replacement. Like the E60 that served as a stopgap during the late GG1 era, a new locomotive was introduced in 1999, the HHP8, and like the E60 these locomotives have been only marginally successful. To replace both the HHP8 fleet (which totals 15 units) and the AEM7s, Amtrak has purchased 70 ACS-64 locomotives from Siemens Mobility. And that brings us to February 7, 2014. The day was sunny, so I headed down to Princeton Junction, N.J., to watch the parade of trains that pass through. New Jersey Transit had ordered sister locomotives to the AEM7 in the form of very similar ALP44 locomotives; all of these have already been retired. The successor is the ALP46, and a few of these passed through Princeton Junction on this day. The NJT trains operate push-pull, so the locomotive can be on either end. The tower is Nassau Tower, and the photo angle here has just recently been opened up by the removal of trees near the tracks. The premier trains on the corridor are Amtrak's Acela Express trains, which have a decidedly European look (about as European as anything you'll find in North America, anyhow), and a few of these sets came speeding through Princeton Junction, kicking up ice chunks from along the right of way. A couple of trains had HHP8 locomotives leading. A few of these locomotives will likely stay on the Amtrak roster into the future, but not as passenger power. They will likely be used in work train service on the corridor. And, of course, the workhorse of the Corridor, the AEM7, made multiple appearances. I started photographing trains seriously around 1979, just as the AEM7s were making large inroads into the GG1 fleet. 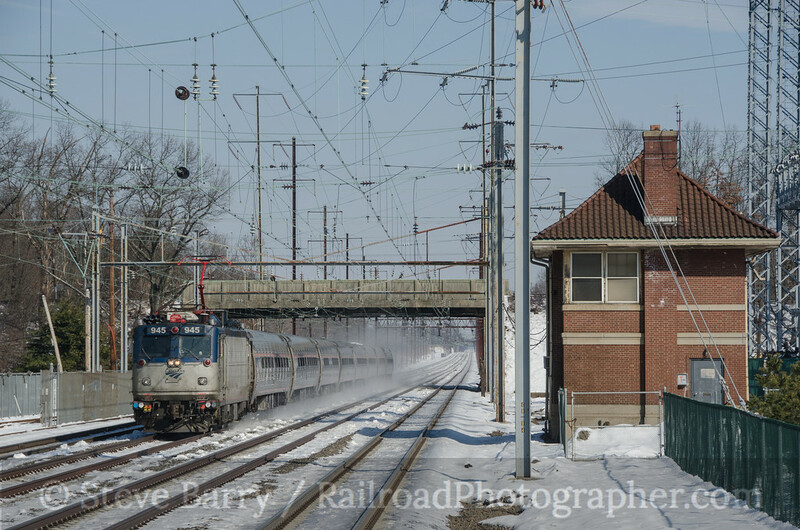 These locomotives have always been a part of my frequent visits to the Northeast Corridor. So why was this day so important? Amtrak's new ACS-64 locomotives have been testing on the Northeast Corridor for a few months now, but when ACS-64 No. 600 led train No. 171 south from Boston to Washington on this day (see the photo at the top of this post), it marked the first time that an AEM7 had been bumped from pulling a revenue train by the new locomotives. 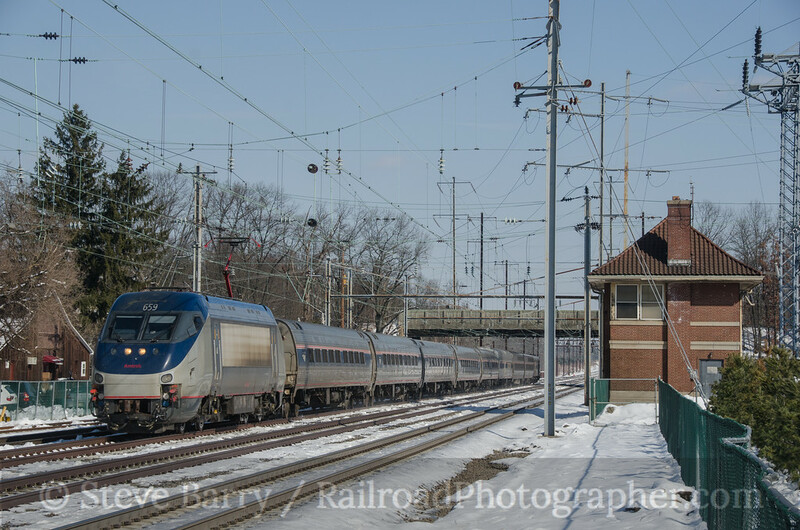 One run on one day may not seem like much, but it was the official beginning of the end for a fleet of locomotives that have served Amtrak for three decades. For a complete set of photos from this day click here.